It’s my first Art Walk Thursday ever. So this should be special. Of course, that means I can’t feature the Woman as well, we all know about her. 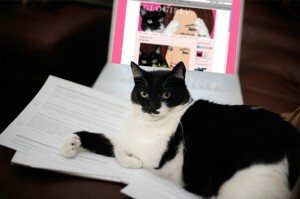 I thought that seeing Katie is now having a great promo for her new business, Glogirly Design, that I’d feature her. As you know Katie is having a contest on her blog with a variety of give aways. I asked how much was being given away and Katie added everything up on her toes and toes and said, “The total value of all the graphics and design services we are giving away this week is $380. This includes Friday’s GRAND PRIZE, a Blog AND Facebook Makeover. In addition, we are also giving away a few pieces of official GLOGIRLY swag valued at $50! ” I’m impressed she has so many toes. Wow. So get entering, right? We looked over at Housecat Confidential and asked if they specialized in cat graphics and Katie told me that they would help anyone, cats, rats, ferrets, goats, dogs and even humans with their design needs. 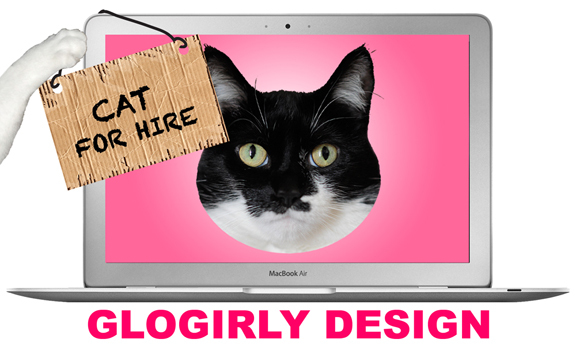 In fact, Glogirly is prepared to help with blog headers and backgrounds, Facebook pages, book covers, Special Celebration graphics, Logos, Business Cards, Swag Design, YouTube Channel Background, Videos and Blog Pages. Wow. That’s a lot. So, is everyone ready to stroll on over there and see those great designs Katie has going on? Have you entered? Check out the posts from this week–winning is just as easy as leaving a comment! Thanks for the cool article on us!!! We’ve been having TONS of fun this week with the giveaways. We’re not drawing names until 11:59 CST this Saturday night, so there’s still time to leave some comments and cross some paws. Just one thing…let’s be clear. I’M in charge of this whole thing…Glogirly is merely my graphic assistant and chief salmon supplier. She sure is doing some amazing work…. think she could spruce up three mugs like ours? Maybe we’ll win the big Kah-Tuna! Ms. Katie…. we’re ready for our close-ups! Katie and Glorgirly do amazing work. I am glad that you chose them for your first artwalk. I have entered one of the drawings. Glogirly is awesome and very talented! My human wants to use her work for some book design at some point. We love all the things Glogirly and Katie have done…they are very talented! They bost always impress and amaze! Glogirl do some clever things, we are off now to look at their competition. Thanks for mentioning this. Miss Katie is a pure genius and oh her helper is , well, er…very helpful. Glogirly and Katie are a very talented duo. This was a super Art Walk Thursday!! We have our paws crossed, hoping to win one of her contests! super creative and quite talented! Great post and we are thrilled to have met the talent behind Glogirly in person!! Debbie is such a sweetheart and we wish her all the success in the world!